Passion is defined as an intense desire or enthusiasm for something. It is a willingness to do what needs to be done and a desire to reach peaks not yet climbed. It is a faithfulness that is created by knowing, understanding and believing the promises of God. The passion for Jesus Christ must be reflected in our prayer lives, giving and faithfulness. Our actions must reveal the passion that we have for Jesus simply because it may be the difference between heaven and hell. It may be old time religion, but it is relevant to the world today. We need to work, teach and preach with passion so that a world without direction can have a relationship with Jesus Christ. Finding my place in God! Have you ever wondered where you fit in the body of Christ? I believe that everyone that has a true relationship with Jesus Christ should have a desire to be used of Him and therefore utilize their talents to further the gospel of Jesus Christ. This principle is illustrated in the parable found in Matthew 25:14 - 30 where Jesus taught concerning the three servants that received talents according to his ability. (I encourage you to read this parable). ... Well done, good and faithful servant; thou hast been faithful over a few things, I will make thee ruler over many things: enter thou into the joy of thy lord. I came across this video on www.youtube.com. As many of you know, Cornerstone Chapel hosted a concert in October with Bro. Cortt Chavis and we appreciate his ministry and his humble spirit. We have already booked him for September 12, 2009 for a concert to take place on Town Hill in Colonial Beach, Virginia. The X that is pictured above sits on a shelf in my office. I received it while at Direction '08 in St. Louis. It is made of wood and is painted red. There is nothing spectacular or beautiful about this X, but it represents something that is powerful and meaningful. If we are to multiply, then we must multiply the amount of leaders, saints and churches. We must broadcast our vision beyond the walls of the church building and preach the Gospel with a renewed desire to reach the lost. We need to multiply ourselves and our church. Our desire should be to see churches in every town, county and city. The passion for souls should consume us and our prayer life should reflect our desire to reach the lost. 2 Timothy 3:1 (Amplified) BUT UNDERSTAND this, that in the last days will come (set in) perilous times of great stress and trouble [hard to deal with and hard to bear]. And He said to them, Go into all the world and preach and publish openly the good news (the Gospel) to every creature [of the whole human race]. Romans 6:4 (Amplified) We were buried therefore with Him by the baptism into death, so that just as Christ was raised from the dead by the glorious [power] of the Father, so we too might [habitually] live and behave in newness of life. Psalms 16:9 Therefore my heart is glad, and my glory rejoiceth: my flesh also shall rest in hope. LONDON (Reuters) - The international financial crisis has given world leaders a unique opportunity to create a truly global society, Britain's Prime Minister Gordon Brown will say in a keynote foreign policy speech on Monday. In his annual speech at the Lord Mayor's Banquet, Brown -- who has spearheaded calls for the reform of international financial institutions -- will say Britain, the United States and Europe are key to forging a new world order. "The alliance between Britain and the U.S. -- and more broadly between Europe and the U.S. -- can and must provide leadership, not in order to make the rules ourselves, but to lead the global effort to build a stronger and more just international order," an excerpt from the speech says. You can view the rest of the article by clicking here. Habakkuk 3:19 The LORD God is my strength, and he will make my feet like hinds' feet, and he will make me to walk upon mine high places. Each of has a status quo. It is our habits, lifestyle and routine existence. We breathe and eat our status quo and each time that we look in the mirror, we stare at what we currently are. For many people, they are satisfied with their current state of affairs. They have no dreams and ambitions to be more than what they are at any one moment. In their minds, they have achieved all that life has for them. Their rhythm of life has flat lined. The ambition of Abraham Lincoln, allowed him to overcome his many failures to become our greatest president. The approval of our current situation or status quo is an attitude that precludes us from achieving the greatness for which we are destined. It is what causes us to remain in a rut without the hope of change. Living in a constant state of affairs without a change of scenery. • Where do I go to school? • Who will I marry? • How many children will I have? • Where will I work? • When do I retire? If I can for a moment, tell you about Moses. Moses was a prince of Egypt. He had all that he wanted including the best education, but his situation was complicated because he was a Jew living in the house of Pharaoh as Pharaoh held Moses’ people as slaves. Moses came to understand that his status quo needed to change. His life was not what it should be and although he had accomplished a lot in the physical… there was something missing. He did not have a relationship with God. 1 Peter 1:8 Without having seen Him, you love Him; though you do not [even] now see Him, you believe in Him and exult and thrill with inexpressible and glorious (triumphant, heavenly) joy. Psalms 71:5 For thou art my hope, O Lord GOD: thou art my trust from my youth. If you are in need of a change in your status quo, then Jesus is here to meet you. Habakkuk 3:19 gives us the promise to walk in mine high places. We can move to higher levels in Jesus saying no to status quo. In shedding the shadow of our status quo, we must look to Jesus. We need to seek Him and He can fill you with His wonderful Spirit. Matthew 16:17 Jesus answered and said to him, You are blessed, Simon, son of Jonah, for flesh and blood did not reveal it to you, but My Father in Heaven. Matthew 16:18 And I also say to you that you are Peter, and on this rock I will build My church, and the gates of hell shall not prevail against it. It has often been said that "Rome was not built in a day", but if you travel to Italy today there stands a magnificent city named Rome. I am not sure the history of Rome, but I am sure that it began with one brick. We can also appreciate the concept that "A journey of a 1,000 miles starts with a single step". Surely, it would be wonderful and grand if we were able to reach our destination within blink of an eye, but we are governed by the laws of time and physics. We are part of a brilliant beginning to a chapter in apostolic history that will document a church that experiences the power of Pentecost. This chapter will be filled with those experiencing the infilling of the Holy Ghost and baptism in Jesus name as in the book of Acts. It will document the healing of the sick, the deliverance of those bound by sin and the preaching of the apostolic doctrine. 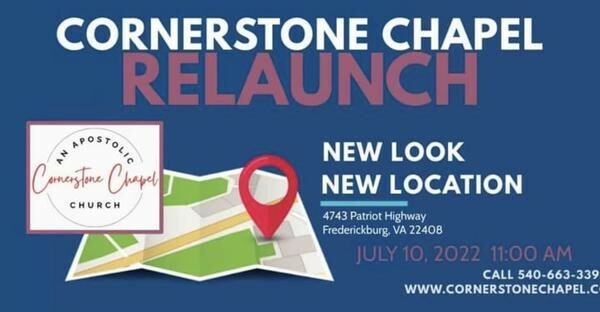 Cornerstone Chapel will be a church that impacts its community while carrying the burden for the lost around the world. It will be a place that will build leaders, pastors, evangelists and missionaries. Cornerstone Chapel will preach the gospel of Jesus Christ to those that hunger for the Word and pray for those that need a touch from the Master. 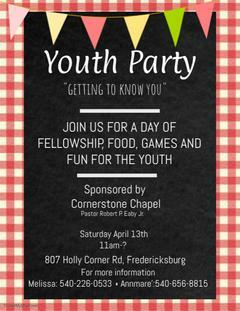 Cornerstone Chapel will be a giving church. It will sacrifice its time and money to reach those that have not felt the love of Jesus Christ. We will support with prayer and finances missionaries that have been called to foreign countries and North America. How precious is Your loving-kindness, O God! And the sons of men take refuge under the shadow of Your wing. Matthew 16:18 ...and upon this rock I will build my church; and the gates of hell shall not prevail against it. The church is not built on shifting sand, but on the Rock that is Jesus Christ. I John 4:4 ...because greater is he that is in you, than he that is in the world. 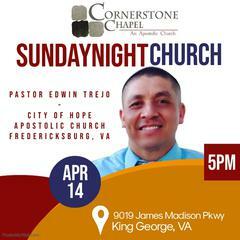 Cornerstone Chapel is a Spirit - filled church that believes in the power of the Holy Ghost. It is a church that will preach the new birth experience from this day until the rapture of the church. It is not enough to feel the Spirit of God, but we want you to experience the Holy Spirit. The church is not a building or a physical place, but the people of God. It is written. 1Corinthians 6:19 What? know ye not that your body is the temple of the Holy Ghost which is in you, which ye have of God, and ye are not your own? Sarah Palin comes from a church that speaks in tongues and there is a thought that she has experienced this phenomenon herself. The media has written editorials and drawn cartoons poking fun at Governor Palin and the many Christians that speak in tongues. Their concept of this Biblical experience is based on their ignorance and like many that are bias lash out at what they do not understand. Speaking in tongues is something that has not just emerged from the Christian world, but occurred at the birth of the church. This event was documented in Acts 2:4, “And they were all filled with the Holy Ghost, and began to speak with other tongues, as the Spirit gave them utterance.” The New Testament church experienced the infilling of the Holy Ghost with the evidence of speaking in tongues as part of the salvation experience as documented in book of Acts. Jesus prophesied this experience as something that His believers would practice. Mark 16:17 states “And these signs shall follow them that believe…they shall speak with new tongues”. The Holy Spirit is life changing. The key to the Pentecostal movement is not the programs that a church offers, but the power of God that is evident in the life of the person that has received it. Pentecostalism is not a religion, but an experience with God. It is no longer “back woods”, but has come to the center of the religious and political world. It is sad that in America one can use the freedom of the press to try to influence and degrade those that exercise freedom of religion. The lack of knowledge that the media has concerning religion reveals a generation that is moving away from God, but according to Romans 14:11, “For it is written, As I live, saith the Lord, every knee shall bow to me, and every tongue shall confess to God”. Although, I have my own political views, they are not brought into the pulpit. In light of yesterdays events, I do want to say a couple things. We are first Christians and stand on the principles of scripture. The ideas of politicians and government are a distant second to the Biblical principles that are taught each Sunday in the pulpits across America. The ideas of our new government have the potential of being in line with many of the ideas of the liberal thinking of Europe. This can be dangerous to the doctrine of the Christian church. The first church faced down the government and preached the doctrine..
With all the current events that may confirm Biblical prophecy, I found this online. Is one church coming true? A London businessman told the story of a warehouse property he was selling. The building had been empty for months and needed repairs. Vandals had damaged the doors, smashed the windows, and strewn trash around the interior. As he showed a prospective buyer the property, Clegg took pains to say that he would replace the broken windows, bring in a crew to correct any structural damage, and clean out the garbage. "Forget about the repairs," the buyer said. "When I buy this place, I'm going to build something completely different. I don't want the building; I want the site." …surely every man is vanity. Paul went from murderous thug to the greatest missionary and apostle writing much of the New Testament. His life is a testimony to the grace and love of Jesus Christ that is life changing. Nothing was ever the same. Testimony: Cornerstone Chapel sent out mailers last year offering prayer. On Sunday, a lady came to the church from those mailers and received the Holy Ghost. She was praying at the altar and when I asked if she had the Holy Ghost with the evidence of speaking in tongues, she said "no". When asked if she wanted it, she said "yes" and instantly started speaking in tongues. God is doing miracles in our community.